* Rates per player. Promotional offers cannot be combined. We recommend to book your game before showing up! We can order a birthday cake for you, a delicious chocolate cake from Tartes Françoise : € 2,5 per slice. * Rates per player, minimum 6 players. Promotional offers cannot be combined. Upon reservation only: please anticipate… Saturday afternoons are often stormed ! It is possible that you will play with other groups. The privatization (paid option) of your games is also possible. WE ACCEPT FOOD FROM OUTSIDE (EXCEPT CHIPS) UPON PAYMENT OF 1€ PER CHILD. Promotional offers cannot be combined. According to your needs, we can privatise the place from 8 am until late night, and welcome up to 125 people. 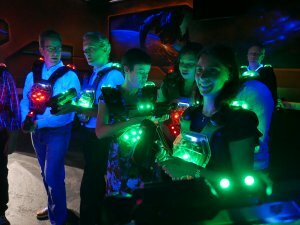 For the Laser Game, 32 people can play simultaneously every 20 minutes. 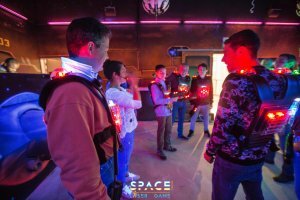 Our Space Laser Game is ideally located in the Saint Michel Shopping Centre (Carrefour Market – Thieffry Station) in Etterbeek, only a few minutes away from the Arsenal, the ULB/VUB Campus, Merode, Montgomery and the Parc du Cinquantenaire/Jubelpark. Easy access by car and public transport; at the foot of the Thieffry metro station (line 5); a few steps from Boileau (tram 7), bus lines 81, 36 and 25. 150-place parking, FREE for the first 2h. Treat your employees, their families and children. We are open 7 days a week every day of the year at the following hours and even more upon reservation. Do not forget to call ahead to reserve and make sure you can play. 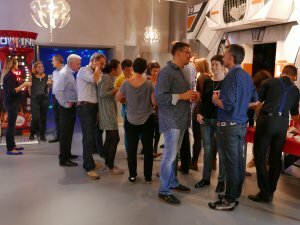 The Laser Game could open and/or close its doors later or sooner if there are no reservations. 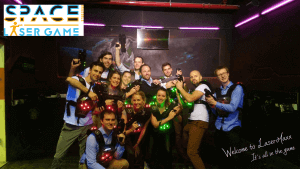 The Laser Game is open every weekday from 10am during holidays. We are open 7 days a week every day of the year, at the following hours and even more upon reservation. Easy access by car and public transport; at the foot of the Thieffry metro station (line 5), a few steps from Boileau (trams 7 and 25), Montgomery (tram 81), and bus station Thieffry (line 36). 150-place parking, FREE for the first 2h. The entrance of the parking lot is in front 1 Rue de l'Escadron, to the right of the Brico Store. Watch out! We request that you arrive approximately 15 minutes before the start of your game, otherwise you risk losing your reservation to other players booked after you did. You are well registered, thank you !